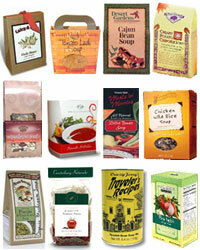 Soup of the Month Club features soup mixes that will bring warmth and cheer throughout the year. The Soup of the Month Club includes two (occasionally three) soup mixes each month. We look for unique and delicious mixes from smaller producers. Each mix typically makes 6 - 12 cups for at least four servings. Many mixes require nothing more then the addition of water, but some do require (or suggest) additional ingredients. Take a look to the left at just a few of our past selections. Some of the past varieties we have featured include Italian Style Wedding, Cold Winter Day, Pasta & Wild Rice, Creamy Broccoli Chedder Bisque, Classic French Onion Soup, Tuscan Tomato Soup, Cheesy Enchilada, The World's Best Bean Soup, Spanish Bean, Green Chile Stew, Potato Cloud Soup, Southwest Pasta, Tomato Leek, Tuscan Bean, White Cheddar Asparagus, Mama's Minestrone, Louisiana Style Gumbo, Country Style Corn Chowder, Italian Pasta & Bean, Curry Chicken with Brown Rice, Dilled Tomato, White Bean and Pasta and many more.